...and I am so not ready for it! ROFL Here are the books I have to read this semester for two of my classes and then I have Adobe Photoshop and Photography II! I am excited and nervous. The English classes do not really make me nervous, though I will have to write several papers, but the PS and Photo classes make me nervous! Go figure. I am really excited about taking them though! I guess I am nervousing because I took Photo I from the same instructor and so did not do well on the tests. I made a B in his class the first semester I was at TU. At least I will know what to expect by way of tests though. Anyway, I am getting PhotoShop CS4 or the newest edition whichever is best. I cannot wait! Oh yeah, and see that really THICK book on the right?? That is, of course, the first one I have to read. Needless to say it is now on my iPod Touch! Thanks! And thanks for looking! Wow. Lucky you. I don't think I could stomach reading that many books - I have to have in interest in them. I would love the photography courses though. Have fun! Thanks, Sis. 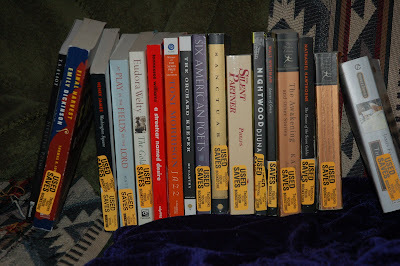 And the crazy thing is I have one more that was lost in the pile that is twice as thick as the first one I have to read. A Connecticut Yankee in King Arthur's Court, I believe is the name! Yay!